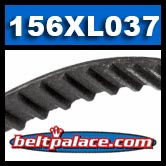 156XL037 HTD Timing Belt. *CLEARANCE SPECIAL* Industrial Grade. 15.6" Length. 78 teeth. 3/8” (0.37”) wide. 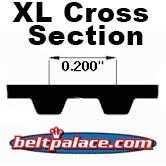 Neoprene (black rubber) replacement “156-XL Series” industry standard Timing Belt. Popular replacement belt for electronic equipment and power tools such as power sanders, woodworking tools & lathes, pumps, and robotic equipment. Toothed Gear Belts marked “156XL” at 3/8” Width. CLEARANCE PRICED WHILE SUPPLIES LAST. ALL SALES FINAL. NO RETURNS. 150XL037 Replacement Toothed Belt. 75 Teeth, 15" Pitch Length. Popular replacement belt for power equipment such as Ryobi sanders, Martin Yale CV7, Pegasus water pumps, and robotic equipment. Replaces: Rockwell Table Sander RK7866 belt, RYOBI BD46075 Drive belt, Great Wall 150XL-037.